'Gravity is climate'? WTF?! | Watts Up With That? From the Helmholtz Association of German Research Centres evidence that maybe, just maybe, climate has become a singularity unto its own, and everything now in the physical world is “climate”. Or…they’ve jumped the shark. The headline of this press release is mind-blowingly stupid. How much ice is Greenland is really losing? – Movement in the Earth’s mantle? – Enough water for all? For the first time, the melting of glaciers in Greenland could now be measured with high accuracy from space. Just in time for the tenth anniversary of the twin satellites GRACE (Gravity Recovery and Climate Experiment) a sharp image has surface, which also renders the spatial distribution of the glacial melt more precisely. The Greenland ice shield had to cope with up to 240 gigatons of mass loss between 2002 and 2011. This corresponds to a sea level rise of about 0.7 mm per year. These statements were made possible by the high-precision measurements of the GRACE mission, whose data records result in a hitherto unequaled accurate picture of the earth’s gravity. But there’s more. The uneven distribution of mass on and within the planet causes, due the resulting variability of gravity, the earth to have an irregular shape, which deviates significantly from sphericity. Known as the “Potsdam Gravity Potato, the geoid has achieved global notoriety. But this potato shape is equally subject to temporal changes. During the last Ice Age, a mile-thick ice sheet covered North America and Scandinavia. Since the ice melted, the crust, now liberated from its load, continues to rise to this day. This causes material flow in the earth’s interior, in the mantle, to replenish. With GRACE, this glacial-isostatic adjustment can for the first time be accurately detected globally as a change in the geoid height: the ice ages continue to have an effect, which is especially evident in North America and Scandinavia. On 17 March 2012, the two GRACE twin satellites will have been in orbit for exactly 10 years. The scientists named them “Tom and Jerry”, because they chase each other on exactly the same orbit around the earth. Since their launch from the Russian cosmodrome in Plesetsk, the two satellites have circled the Earth more than 55 000 times on a near polar orbit at about 450 to 500 km altitude and a distance of 220 km, and continuously collected data. GRACE is a joint project of the U.S. space agency NASA and the German Aerospace Center (DLR). The mission was planned in 1996 by the GFZ German Research Centre for Geosciences, the University of Texas Center for Space Research (UTCSR) and the Jet Propulsion Laboratory in Pasadena, and in 1997 was selected to be the second mission in NASA’s program Earth System Science Pathfinder (ESSP). The scientific analysis of the data is carried out jointly by GFZ, UTCSR and JPL. Principal Investigator of the mission is Prof. Byron Tapley (UTSCR), Co-Principal Investigator is Dr. Frank Flechtner (GFZ). Especially noteworthy: with GRACE, NASA for the first time commissioned a non-American company to build satellites. Astrium in Friedrichshafen, who built the GFZ’s founding father satellite CHAMP (Challenging Mini-satellite Payload), produced the satellite duo GRACE for NASA. The primary scientific goal of the GRACE satellite mission is to measure the gravitational field of the earth and its changes over time on a global scale with unprecedented accuracy. If the earth were a homogeneous sphere, the two satellites would orbit at exact elliptical orbits around the Earth. But the uneven distribution of mass causes perturbations in the trajectory. “Their analysis allows us to derive the irregular structure of the Earth’s gravity,” explains Dr. Frank Flechtner. “This, however, requires the satellites’ orbits to be measured with high precision. Each of the two GRACE satellites is therefore equipped with a GPS receiver for positioning, an accelerometer to correct for disturbing forces due to the residual atmosphere and solar radiation, and two star trackers to determine the satellites’ position in space.” But the core is the ultra-precise distance measurement system developed by NASA / JPL, which allows the separartion of the two satellites to be continuously measured with a precision of one tenth of a hair’s breadth. The mass balance study of the continental water content, which is ultimately a sum of precipitation, evaporation, runoff and storage. GRACE monitors the season-dependent changes in the major river basins, but also the huge groundwater extraction due to irrigation in northern India and California. Quantification of the increase or decrease of the ice and snow masses in the polar or large glacier areas. GFZ scientists were able to demonstrate a strong correlation between the climatic phenomenon ENSO / La Nina, the rainfall patterns in West Antarctica and the reduction of ice mass there. The observation of surface and deep currents, which – in combination with the sea surface topography derived from satellite altimetry – brought about a much better understanding of the global ocean circulation and thus the heat transport from the equator toward the poles. The first-time possibility of separation of mass (ice melt) or temperature (global warming) induced sea level changes. The changes in the solid earth after large earthquakes, such as Sumatra-Andaman (2004), Chile (2010) and Fukushima (2011). The ‘Potsdam Gravity Potato’, originally developed in 1995, is now much more precise thanks to GRACE. This is not a gimmick, but is required, for example, to improve the trajectories of geodetic satellites and derive accurate global reference systems from them – a prerequisite for the combination and evaluation of various global sensor systems such as the Global Positioning System (GPS), Satellite Laser Ranging (SLR), the satellite altimetry or local gauge measurements such as for the observation of sea level rise. Another scientific objective of the GRACE mission is to derive about 150 globally distributed vertical temperature and water vapor profiles from GPS data on a daily basis. These data reach the GFZ via its own receiving station in Ny Ålesund (Spitsbergen) and are delivered to the global weather centers within 2 hours to improve global forecasts. In addition, these data are used for studies of climate induced changes in the earth’s atmosphere. Right from the beginning, GRACE was planned to be an international program. “For the 10th Birthday, the researchers have devised a special gift for the more than 3,000 users”, says Professor Reinhard Huettl, Chair of the Board of the GFZ. “The entire mission was recalculated with improved correction models, instrument data and processing standards.” Initial analyzes show that the accuracy of gravity field models could be further improved by a factor of 2. These new models will be released to the global users on 17 March via the Information System and Data Centre (ISDC) of the GFZ. Oh say can you see modern sea level rise from a geological perspective? I can’t find the story on their site; I’d bet, however, it made more sense in German. Actually a superb achievement, the mission is wonderful science. The more egregious comments reflect the normal rent seeking behavior common to federally funded scientists, it is considered good form to have your project produce conclusions consistent with the national policy of the day. As long as the raw data is not adjusted out of recognition and then discarded, there will be useful results eventually. When the mass of the ice sheet changes the gravity changes, but does that necessarily guarantee that when GRACE measures a change in gravity it is necessarily measuring a change in ice sheet mass? This is what is really vapid …. exactly what HASN’T been observed …. by anyone or anything actually measuring sea level. Actually take that back … I mis-read 0.7mm as 7mm….. whoops. Once more you reveal your complete ignorance of what is going on, and how scientists are working that out. Changes in gravity are indeed telling us about the climate changes – in Greenland, Antarctica, Alaska and elsewhere. Indeed, only last month you were lauding a study based on GRACE that showed minimal net losses in the Himalayas. So what is it to be? excellent tool for assessing trends in ice and water movements, or those crazy scientists jumping sharks? Or are we simply seeing knee jerk reactions to whatever gets into your RSS feed? Yes, “ein Orbitalschwerpunktkartoffelverarbeitendenmaschine” is a useful device. Gravity is absolutely the ideal parameter for post-rational scienc-ey types to measure and interpret. Third, changes in gravitational attraction can be caused by myriad things (any change in mass distribution), none of which is unique nor uniquely verifiable. The interpretation depends ENTIRELY on data reduction and MODELING. Perfect. GRACE can probably detect butterfly wing-beats and forecast the effects around the globe. When you look at the “Cryosphere” section of the IPCC’s draft AR5 documents due for publication if 2013 you will find several studies of the rate of ice loss world wide. Even with the help of the GRACE, the measurements cover a broad range of values. For argument’s sake let me suppose that the highest number is correct, in which case the ice is melting at a rate of 285 Gt/year. That sounds like a really scary number until you put it in context. The current “Ice Inventory” for the planet averages ~3 million Gt. If the present rate of loss continues we could be rid of all permanent ice cover in 10,000 years. While much of the science in the WG1 drafts is first rate, the summary completely fails to put things in context leaving the door open for alarmist interpretations being delivered in the “Summary for Policy Makers”. Those who would pick our pockets want the money now rather than in a thousand years so they exaggerate the dangers by orders of magnitude. Thay’ll need to improve their accuracy a little. The 2011 earthquake was off Miyagi, not Fukushima. That’s about 100km lateral error. Don’t give up the day job, boys. Oh please. “Gravity is Climate” is a jump the shark headline or just lousy copy that’s sensationalized. “Gravity can inform some small bits about climate variation” is a true statement. New Mexico regulators pulled the plug Friday on the state’s effort to reduce greenhouse gas emissions among coal-fired power plants, refineries and other large polluters. The Environmental Improvement Board adopted a repeal petition filed last year by utilities and industry groups that were concerned about rising costs and New Mexico’s economic viability. The board found that the regulations were not justified, that they violated New Mexico law because they were more stringent than what the federal government requires and that the state’s adoption of federal permitting rules had actually triggered a sunset clause related to the greenhouse gas emissions regulations. Environmentalists said the federal permitting rules, which have been placed on hold by the Obama administration, won’t do enough to curb emissions. you will note that the difference in “absolute” surface height between that blue spot in the Indian Ocean basin and the big bulge north of Australia is almost 200 meters just across that relatively short span of the globe. ( I put quotes around absolute since it is fundamentally impossible to know the ocean height in that way because no baseline reference for it exists). In reality the seas are never level and any changes to their volume, whether from steric changes or from volume added by melting ice, will never be reflected uniformly across the planet. – There is something fascinating about science. One gets such wholesale returns of conjecture out of such a trifling investment of fact. – When we remember we are all mad, the mysteries disappear and life stands explained. lol, yes such precision…. let’s see….. ice melt measured by Grace….. there was a study just published which used Grace to measure the Himalayan glacier melt…… precisely showed a mass loss of only 4 ± 20 Gt yr−1…… let’s not start pretending they can measure sea-level to 1/10ths of a mm. That precision is derived by “fun with numbers.”. Some foresters are reported to have sold their credits for a lucrative sum. But at the moment, things are in limbo. However, with the carbon price falling from $21 in April last year to less than $8 today, the trading scheme has all but ground to a halt. David Rhodes says that needs addressing. So with the currant rate of mass loss in a bit less than 120 thousand years it’s all gone. We better start moving to higher ground immediately. The news came as sources said China was suspending the purchase of 10 more Airbus jets, escalating a trade row over airline emissions. In a decision obtained by Reuters, the council instructed a working group to continue its study of “market-based measures” to deal with aviation emissions and report back at the next council meeting, scheduled for June. It also asked the working group to evaluate whether the measures being studied can “accommodate the special circumstances and respective capabilities of developing countries”. The European Commission has said it was forced to act alone after ICAO failed to come up with a viable plan. It said it will modify its law if the ICAO comes up with an acceptable alternative. This reminds me of Luboš Motl’s blog post showing why sea level in Iceland would drop if Greenland ice melted. I believe that number is a serious underestimate. By my admittedly rough calculation there is over 20 million Gts in the Antarctic icecap alone. Approx 15mil km2 land area X 90% ice cap coverage X 1.7 km average depth = 20+km3 of ice. As I recall 1km3 = 1Gt. Look into the Isostatic adjustment (glacial rebound). Smith et al used GPS mounted on bare rock to calculate the adjustment but was rejected because it showed an increase in the ice, (more gained in the center than lost on the rim). Velegona (sp?) et al used a modeled isostatic ajustment to come up with the politicly correct answer. The funny part is, they used data from the precipitation models in thier model. if this is true, Greenland must have an enormous Schwanzstuker! Gravity changes can not prove ice melting, because there are gravity changes also in places, where there is no ice and nothing has changed on the surface. I have said this before – GRACE can only detect mass changes, not the source of the mass change. There is no, repeat ‘no’, way for anyone tie changes in the Earth’s gravity field to melting ice. Take it for the NASA Systems Engineer with a quarter of a century of experience. GRACE only knows something between the center of the Earth and it’s orbit altitude changed. Nothing more. > Oh please. “Gravity is Climate” is a jump the shark headline or just lousy copy that’s sensationalized. Gravity is what you expect, weather is what you get? suggests that the supposed 20 meter change in sea level 400,000 years ago, based on sea level artifacts on Bermuda and the Bahamas which are supposedly tectonically stable, may be off by as much as 10 meters because the islands actually subsided that amount due to the isostatic rebound resulting from the retreat of the North American ice sheet. In case you find that as confusing as I first did, the theory, as I understand it, is that the depression of the mantle caused as the ice sheet built caused the mantle under the islands to bulge upward. When the ice retreated and the mantle rebounded, the bulge subsided accordingly. The thing is paywalled of course, but here’s the abstract. Pat thanks for this and the other news on carbon trading collapse/Ponzi scams, they are good and welcome news against the insanity of the warmist fraudsters. Another thing about the alleged ice melting is this. Has anybody seen water flowing from the Greenland ice sheet? I do not think so. You know, ice can not melt without turning into water. Just a thought. When the ice melts we get a rebound effect on the crust. This rebound is filled in with magma under the crust changing the density / mass in that general area. Seems to me that calculating the loss of ice mass vs the increase of mass do to magma would be very hard to calculate. This will help with their budget ( the add climate to the header effect ) but I hope they continue to do the real work in gravity pretty slick stuff. It is to be the use of language that seeks accurately to reflect reality. You are building a fine strawman. But if you are not, then you are incapable of identifying the the inherent linguistic error in the title of the article. To say that ‘gravity is climate’ is about as ridiculous as someone claiming ‘my fist is your face’ when you get punched in the nose. Should of course be “on a somewhat related note” although I must admit to at least a chuckle, if not real elation, when another piece of the “settled science” is brought under suspicion. Just one question: Is gravity ‘Green’? Happy St. Patrick;s Day, YAll! Another Killians Red is about to experience a tipping point…. Splendid comment. The hype given to anything that can be interpreted as supporting AGW buries the real science in rubbish. Grace is so hyped you would think that the authors have confused the twins with LeBron James. LOL! If only Mel Brooks could be president. Interesting thought. Maybe the converse is also true and additional ice presses the crust further down, decreasing the amount of liquid rock below and lowering the local gravity. Maybe lower gravity = more ice. I remember well that GRACE results have been downgraded to half. Yes, it can, below 0. Now, given no one has seen water flowing from the ice sheet and, let’s say, there is less ice there (because of sublimation), we have to come to the conclusion, that there have been fewer days with temperatures above 0, which indicates COOLING. Climate science is a funny thing, isn’t it? More explicitly put, the sun’s not yellow. It’s a chicken. John, in the article the words “glacier” and “ice sheet” are used interchangeably, although they are different things. Not good science. Second, you know, generally ice does melt under circumstances, above 0. This mere fact however is not enough to suspect the ice sheet of Greenland to be melting away. This is not science. This is exactly like finding a place in Greenland where the are more ice now and say, the ice sheet is growing. Given the huge amount of ice allegedly melted away from the ice sheet, one should at least ask himself: what has happened whis this huge amount of meltwater, where is it, all of it? And demand a PROOF. That picture in the article is not an answer. The larger the glacier, the longer it takes to come into equilibrium with any change in the climate. The Greenland glaciers (icesheet) will take centuries to come into equilibrium with the warming since the LIA. While 240 gigatons sounds impressive, it tells us nothing of interest concerning AGW. What matters is the rate of change. There is a slight increase in the rate of melting in the short GRACE record, but that in itself is not evidence of AGW. The Greenland icesheet is particularly sensitive to changes in solar insolation, because it is relatively close to the Equator (compared to Arctic sea ice and Antarctic ice). Increasing solar insolation would melt south facing glaciers while having little effect on north facing glaciers. No one has explicitly compared north and south facing glacier melt in Greenland, but this study of regional changes in Greenland icesheet melt, strongly indicates the melt is overwhelmingly in south facing glaciers. GHG warming could not cause this differential melting and solar insolation increases (caused by aerosol and cloud changes) are the only possible cause. Not particularly new, I wrote an article (gravity-temperature related) two and half years ago. If the present rate of loss continues we could be rid of all permanent ice cover in 10,000 years. We will be ok for chicken and chips then. it’s amazing that the jetstream ever manages to work out where to flow. Butterflies flap their wings but is a slight change in shape of a gravity potato a positive or negative feedback or able to flip climatic Lorenz attractors? Particularly note figure 2 in my link above (and repeated below). This clearly shows the melting glaciers are south facing. Exactly. There is convection going on below the solid crust and that surely has an effect that must swamp any changes in ice cover. Ice has a specific gravity of 1, rock generally over 2.5 and molten iron 7.2 . Mind you I suppose if you can impute the effects of man made CO2 as being catastrophic you can impute gravitational changes to melting ice. PNS anybody? ImranCan makes a good point. The reduction in gravity over Greenland supposedly is causing 0.7mm/year sea level rise, which isn’t detected as sea level has been falling recently … or is it worse than we thought? The Greenland ice shield had to cope with up to 240 gigatons of mass loss between 2002 and 2011. This corresponds to a sea level rise of about 0.7 mm per year. We provide an analysis of Greenland temperature records to compare the current (1995-2005) warming period with the previous (1920-1930) Greenland warming. We find that the current Greenland warming is not unprecedented in recent Greenland history. Temperature increases in the two warming periods are of a similar magnitude, however, the rate of warming in 1920-1930 was about 50% higher than that in 1995 – 2005. A layman’s easy read with references. What happened to the Greenland ice back on 14th March 1979? Can anyone help? It seems to have been less. Not much to do with Greenland, I blame Canada or to be more precise, the Hudson Bay area, where you have probably the largest crust uplift anywhere, not to mentioned the true magnetic pole of Northern hemisphere, now in the rapid decline and a corresponding rise in its counterpart in the Central Siberia. As the Hudson Bay weakens further, NE Canada may get warmer, while Siberia may get colder. That is about 3000 Gton / year, so 300 Gton yearly differences in accumulation / melting should not be expected as other than small variations. Icebergs and melting is probably also in the range of 3000 Gton / year. This piece of informantion is a bit confusing for me. The statement says up to 240 gigatons between 2002 and 2011 which I divide by 10 to get an average of up to 24 gigatons per year which I divide by 360 cubic kilometers/mm sea level rise (approximately) times 1 cubic kilometer/ gigaton equals an average of up to ~0.07mm per year. Isostatic rebound is not accounted for and we do not know what the current rate is for the area under the Greenland ice sheet. Am I missing something? We find that glacial retreat, thinning and acceleration have been more pronounced throughout the Denmark Strait, supporting our hypothesis that ocean warming associated with shifts in the Irminger and East Greenland currents are causing increased melt at the ice-ocean interface. Not one mention of solar insolation or aerosols throughout the entire paper. The only mention of clouds is in relation to data collection, not melting. No it doesn’t. It shows some of the south facing glaciers are retreating more than others. Above 69N some of the south facing glaciers are retreating at the same rate as the north facing ones. Again, read the paper to find out a possible explination as to why. Watch a show the other day about the recovery of ww2 aircraft that crashed on Greenland in 1942. AT the time of recovery in 1990, the aircraft was buried under 268ft of ice. Me thinks the ice is getting thicker. Now this is what I call climate change. But if it were to happen today you can bet it would be blamed on Co2. In the last decade of the nineteenth century, between 1892 and 1897, there occurred an enormous outburst of ice from the Antarctic which filled the Southern Ocean with ice floes and icebergs to such an extent that traffic between South America, Africa, and Australia had to seek a more northerly track………………….Reports of ice dangerous to navigation in the Southern Ocean began to appear again in 1922. However one must look at the complete picture. See the graph below to see what happened to sea surface temperatures since 2002. Is it possible the contraction of the oceans exactly balanced the loss of ice in Greenland? Was this even factored in? “Moo, It’s starting to get cold here” says the Greenland Viking cow about 500 years ago. Not so much ice in Greenland historically. From my layman POV, It seems Greenland still recovers from the “Little Ice Age”. I was going to point out that inevitably an GHG AGW compliant cause is proposed based on zero evidence, but I thought it was unecessary editorializing. Do they present any correlations or other evidence to support their proposed cause? Their proposed cause isn’t science, its speculation. There are several studies that show north facing glaciers are not retreating or advancing while south facing glaciers are retreating. Here is one from Nepal. Care to explain how this is caused by ocean currents in the nearest ocean 1,000 Ks away? The interesting bit in the article really is the mass loss that is supposed to translate to a 0.7 mm/year sea level rise. That puts a rather firm (and very low) limit on the arctic melt panic. Above 69N some of the south facing glaciers are retreating at the same rate as the north facing ones. This looks like a case of AGWers making up stuff. But feel free to show that I am wrong. I am delighted when people show where I am wrong because I learn something. According to some alarmists I talk to, gravity is “just a theory” and “not proven” etc. I guess that must be disimilar to theories about AGW, huh? Science settled? I guess also that NASA space missions would be pretty much screwed if “calculations for gravity” were wrong and the missions would fail every time. Yeah right! Patrick, exactly Gravity is not a “force” per se. It is the result of massive objects curving space. Some say. Any surprise? Was it not that all different fields are just ONE? Any water tight compartments in science are artificial, just an entanglement of words, actually a Babel Tower “confusion of tongues” we are living in and which we cherish so much that we cannot see reality. A conspiracy or the conspiracy of foolishness? Credit: Climatology animations have been assembled using JRA-25 Atlas [ http://ds.data.jma.go.jp/gmd/jra/atlas/eng/atlas-tope.htm ] images. JRA-25 long-term reanalysis is a collaboration of Japan Meteorological Agency (JMA) & Central Research Institute of Electric Power Industry (CRIEPI). I could whip up a brief post and send it to Anthony, but it will be years before I have time & resources to elaborate to the degree most seem to crave &/or need, so would some capable-minded readers like to see the raw insights now (without the spoonfeeding)? For the brighter readers (some of whom rarely comment) the graph alone should be enough to trigger at least base-awareness of need for fundamentally-essential reconception, but paradigm shifts can be delayed by long incubation periods as subconscious minds reconcile incompatibilities with earlier misconceptions, which are woven intricately into extensive fabrics, necessitating tedious – & in some cases painful – unraveling & reweaving. According to the data themselves, solar-terrestrial relations don’t work how folks (whether lay, academic, mainstream, eccentric, alarmist, skeptic – or whatever) thought. @Vukcevic: As the Hudson Bay weakens further, NE Canada may get warmer, while Siberia may get colder. A hint of the New Paradigm in Science!, and not precisely “consensual” or “convenient”! Perhaps in the interest of being concise, you were misleading. In response, I pointed out (via that link) that water had been seen. Anyone knowing of the site linked to, or any other similar sites, whether that person being an alarmist type, neutral, or a skeptic, would come away from your comment thinking that poor Greg doesn’t know ‘s’ from Shinola. So, having established that there can be changes in the location and mass of Greenland ice (or Antarctica ice) then the questions revolve around how to measure this and what can we learn from it. “The primary scientific goal of the GRACE satellite mission is to measure the gravitational field of the earth and its changes over time on a global scale with unprecedented accuracy.” This seems to be a reasonable thing to work toward. Insofar as we know ice melts, the point is ‘Can GRACE show where and how much?’. Turning the question around seems not to be a useful strategy. Just saying! We seem to be getting pretty good at doing “Crowd Science” So a lively discussion of your information should be interesting. John, I also said there: “Given the huge amount of ice allegedly melted away from the ice sheet, one should at least ask himself: what has happened whis this huge amount of meltwater, where is it, all of it? And demand a PROOF. ” All of it, John. That’ the point. Logically, you can not conclude from the particular case (a little bit water has been seen) to the general one (a huge amount of ice has turned into a huge amount of water and flowed away from the ice sheet). If it had been so, we would have seen (or have known about) those rivers of meltwater. In other words, non-existence of an inevitable product of certain process is a proof, that this process did not happen. No significant ice melting, John. 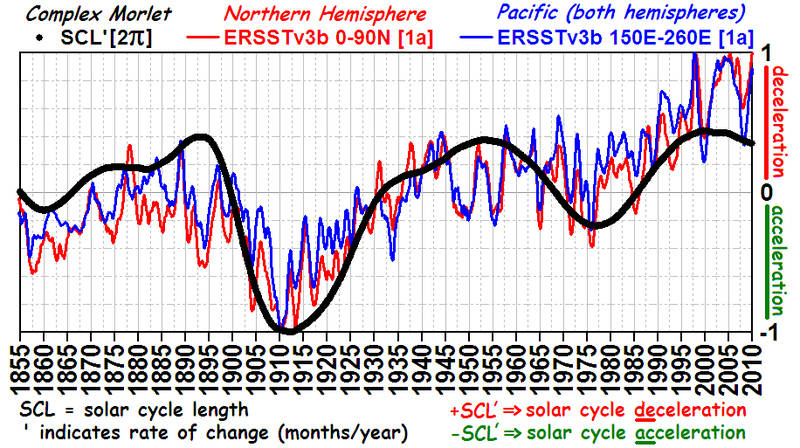 Not long ago Siberia was very, very warm ; NASA-GISS and HadCRU fell for it. It was all Brezhnev propaganda after USSR invaded Czechoslovakia in 1968, to show that they don’t need the American and Canadian wheat. It is obvious that the GRACE satellites were misnamed. I sugget achange to Calvin and Hobbes. Unfortunately, there doesn’t seem to be any evidence that GRACE detected the change in Lake Mead’s height. During the period from 2000 to 2011, Lake Mead steadily dropped from 1210 feet to 1080, a drop of 130 feet (the lake has since started to recover, it’s gained about 30 feet in the last year). During the GRACE period, the lake dropped almost 100 feet. Lake Mead does not appear to be visible in the GRACE gravity models released to the public. If anything, the GRACE plots show that gravity INCREASED in the area surrounding the lake. Lake Mead has a surface area of 247 square miles, so a drop of almost 100 feet should have a delta-gravity signature in water-equivalent mass ( ~300,000 inch-mile^2) many times the water equivalent mass resolution claimed for the system over its spatial resolution of about 200 miles which is better than 40,000 inch-mile^2. Sorry for the funny English units, but you can see the point. The Figure 1 (p.18 = pdf p.19) jump in the 1970s can be traced to a simple resonance somewhere ridiculously simple that inexplicably no one thought to look even though hindsight on this will be a 20/20 no-brainer in the future. Ryskin, G. (2009). Secular variation of the Earth’s magnetic field: induced by the ocean flow? New Journal of Physics 11, 063015. doi:10.1088/1367-2630/11/6/063015. But 240 gigatons is roughly about 240 cubic km of ice. Greenland has over 3 million cubic km of ice. Therefore 240 out of 3 million is absolutely insignificant. What’s to cope with? How about we assume that these scientists know what they are talking about and Greenland has been loosing 200+ gigatons of ice/year for the past few years. How many years is it (at the current rate) until all of the ice melts? I believe it has been stated before that it would take about 10,000 years to all melt away. So, not exactly an issue. Now I would like to know what is happening to the Antarctic ice thickness – seems these guys should have reported on that – perhaps a comparison of the relative melt/freeze rate. Who knows, perhaps Antarctica is freezing ice faster than it is melting on Greenland? Certainly wasn’t covered in this report as far as I can tell. Ryskin paper was discussed number of times on WUWT and many other blogs. I raised it on WUWT sometime in 2009 as soon as it appeared in the press. His paper was published in June, mine version 2 was submitted in late August or early September 2009. L.S. still maintains its nonsense. I think Ryskin got it wrong way around, although there is a minor effect in the other direction i.e. Ryskin’s way. John, why should why buy it and talk about 10,000 years, if there is no evidence of 200+ gigatons of MELTWATER/year flowing into the sea? Who carried away the 200+ gigatons of ice/year then? Please do not say “invisible aliens” (LOL). So, given the impossibility of such a huge ice melting we have all reasons to suspect a sort of scientific/political fraud. The image of the gravitational field is amazing. 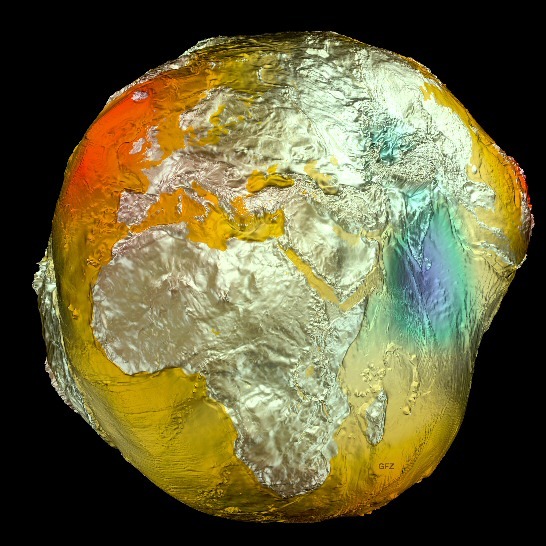 I had always imagined the Geoid as being a roughly regular form like an oblate spheroid but this image reveals it as a very battered potato. It’s more like a potatoid. The interpretation depends ENTIRELY on data reduction and MODELING. So Jim has just proved that all that seismology the oil companies do for oil exploration is just a fantasy and waste of time and millions of dollars. So Jim you run off and tell them that all that computer stuff is rubbish and you know that it is cos you got lots of common sense. GRACE is something of a “johnny come lately” in the satellite geodesy business, though I am sure this recent program has benefitted from more modern technology. However, in the 60’s and 70’s I worked with New Mexico State University – Physical Science Lab on a Navy – Johns Hopkins University – Applied Physics Laboratory program that was in its early stages, called Transit. It was the Navy Navigational Satellite (NNS) program which was a precursor to the GPS system we have today. One of the major projects in the 60’s was to redefine the earth’s geoid but this work continued into the early 90’s and included satellite programs such as GEOS and Seasat. The potato shape was already apparent in the 3-D models developed from work done in the 70’s and was more refined in the 80’s and 90’s. This integrated program used dozens of satellites and utilized new and interesting techniques such as doppler and laser ranging both based on satellite to earth techniques. Seasat used synthetic aperture radar (SAR) methods to determine global values of sea heights for the first time. Some of the first confirmation of plate movements in the new field of plate tectonics were emerging in the early 70’s from data being produced by the NNS system. GRACE and many other modern programs clearly ride on the back of some early giants. Marcel Leroux has explained that the east Greenland melting -just as is the Antarctic peninsula’s- is of dynamical origin, i.e. in the case of Greenland, due to the renewed advections of warm air as a result of more powerful, colder anticyclones coming from the Arctic, a consequence of the rapid mode of circulation that started during the 1970s climatic shift. Moreover such observations are consistent with 1) the Svalbbard island paleoclimatological records during the onset of the last glaciation, showing in fact warming for a while in these regions until the cold finally takes over globally and 2) a recent paper showed that during the LIA, arctic sea ice extent was not greater, on the contrary, lesser than now in these regions. Contrary to the reductionnist approach derived from statistical manipulation of world wide temperatures as a proxy of climatic evolution, what we observe is therefore a transitional period towards a cooling since the 1970s rather than the ominous signs of AGW. Will we get much, much cooler? No one knows. As usual you open it and some non sense comes out. Clearly you have no clue about exploration and how seismic works in this context. Instead of Lazy, go to school. Again, read the article, read the references it cites. You’ll find your evidence. Rubbish. Get 2 glasses of water, one cold from the fridge the other warm from the tap. Drop an ice block into both of them. Which one melts faster? Care to explain how this [paper about glaciers in the Himalayas!] is caused by ocean currents in the nearest ocean 1,000 Ks away? Ocean currents was the cause in the original paper you cited. This one is not. I’ll put this poorly constructed straw man down to the sting of being caught with an ill conceived reference, rather than an indication of your intelligence. What I will say, again (seems to be a common theme) read the article. The global warming of the atmosphere also affects the Himalayan region. This could result in a general reduction of snow cover extent… As a consequence, the albedo of the region is reduced, heating is increased due to larger absorption of solar radiation, and stronger thermal winds (slope and valley winds) develop. All the explanations and conclusions discus thermal winds and the effects they have on the glacier system. That’s an answer I expect from my 6 yr old nephew. Look again. Can you explain how the 3 South facing glaciers at the same latitude as the North facing glaciers have similar rates of retreat? Are you wrong? Depends how you class wrong. On the most basic of levels, you may have a point. However it is more complex than that. Glaciers retreat for many different reasons, which are generally location specific (as the 2 papers suggest). I hope you have learned to link studies that support your position (and that you read them first to confirm). I hope that by going back and reading the studies, if nothing else you learn that there is more to glacier dynamics than your basic explanation. I think your mind is already made up. Ties in with what I said, theres many reasons why glaciers melt/retreat. 2) a recent paper showed that during the LIA, arctic sea ice extent was not greater, on the contrary, lesser than now in these regions. Haven’t heard that one before. Sounds interesting though. Does that add some validity to Curry’s recent paper? Less ice in the artic, changes weather patterns, more snow in some lower lattitudes? Love to read it, do you have a link? Your cite/summary of the NM situation made me wonder (“also scraped rules”) just what a scraped rule would look like. Perhaps the underlying agenda would be exposed to the light of day? Providing a good reason that it should be scrapped. The rest of the paper is predictably warmist but the observation above is not. So does this mean that when the Vikings settled in Greenland and set up farms there (when the climate of Greenland was much warmer and the glacier was no doubt much smaller) that the Earth’s gravity was somehow different to what it is today? Chill out, guys. What? Like we shouldn’t measure the gravity field? If it can register changes in ice and water (or even air) mass, so much the better. But that picture is not a picture of weather, nor of ice, water, or air. It is a picture of the inner gizzardly workings of molten rock. Interesting that the Indian Ocean negative sems to extend north beneath the Himalayas where one might expect accumulated surface mass to at least balance the negative. How cool would it be to see a time series of that picture of an asteroid impact on some nice experimental planet?